If you're looking to replace or refinish a bathtub in your home, consider Miracle Method surface refinishing. A total tub replacement entails a great deal more than just buying a new model. A significant amount of demolition, plumbing, flooring and carpentry experience is often required for a successful replacement. When all is said and done, a total tub replacement can run you well into the thousands of dollars and eat up weeks of your time. The average total tub replacement costs upwards of $3,000 between removal, parts and labor, but Miracle Method can help you save up to 75% off these costs. 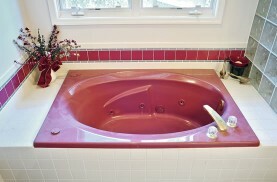 Miracle Method refinished this jetted tub and really updated the look! The Miracle Method process to refinish a bathtub is a quick and cost effective procedure that takes place entirely in your own home. When an expert Miracle Method technician arrives at your home, they'll start by giving your tub a more thorough cleaning than it’s ever had. This deep cleaning process utilizes a specially formulated system of two step cleaners that strips your tub of mineral deposits, body oils and soap scum. This allows for a pristine surface when it comes time to bond the new finish to your tub. 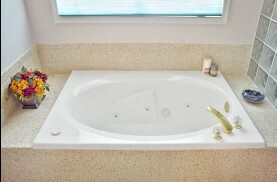 Once your tub is spotless, cosmetic repairs will begin. Cracks, chips and other unsightly surface damage is all repaired using a special repair process. Years of abuse and wear can all be repaired and smoothed over in the course of a few short hours. The final step of the Miracle Method refinishing process involves the application of a high-tech durable acrylic coating. During this final application you can take your bathroom look in a whole new direction. The Miracle Method process allows you to refinish your tub in any number of colors. Everything from basic shades of white to vivid reds are available for your choosing. To add a new level of elegance to your home Miracle Method offers their Natural Accents line of finishes, a revolutionary faux stone look available in multiple colors. Instead of performing a total tub replacement in your home, let Miracle Method refinish your fixtures for a fraction of the cost and time. Choosing to refinish a bathtub in your home affords you the opportunity to not only give your tub a new and extended life, but completely change its look as well. To find a Miracle Method location near you click Find a Location or call 1-888-271-7690.